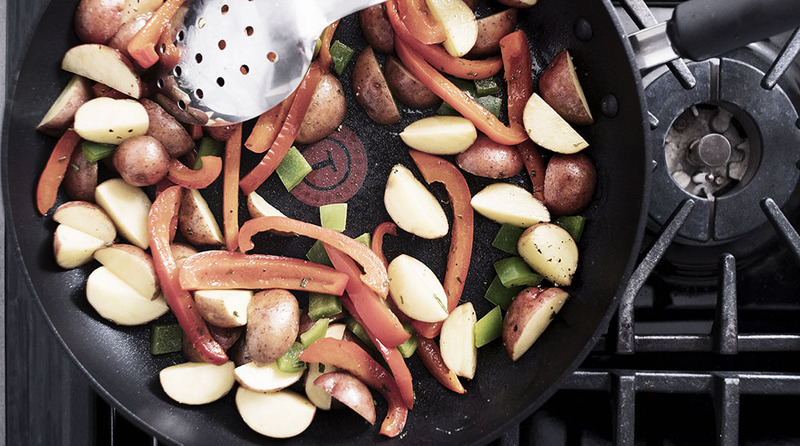 The T-fal Extreme Titanium Frypan boasts about its durability and long-lasting non-stick coating. As you do, when you’re a frypan trying to market to people who don’t have the time or patience for scrubbing off stuck on grit. Well, unlike its competitors, T-fal Extreme Titanium Frypan delivers on its claims – no empty boasts here. The non-stick coating is made with ultra-tough titanium particles. So not only can you easily clean this frypan, you can also use metal utensils on it without worrying about scratching the coating. For someone, like me, who prefers metal over the flimsy plastic or rubber utensils, this is a godsend. Clean up is a breeze, as I’ve mentioned – no scrub brushes or elbow grease required. Which is good, because I couldn’t find any information about whether or not this bad boy is dishwasher safe. Personally, I wouldn’t risk it just in case that durable, ultra tough non-stick surface decides to wither away. Enough about the clean up, onto the cooking experience. After the non-stick coating and durable scratch resistant surface, the next best characteristic of this frypan is the thermo-spot. There’s a faint red dot in the middle of the frypan when it’s cold; this spot turns a solid, dark red when the surface of the frypan has reached the ideal cooking temperature. This was convenient, especially since the non-stick surface removes the need for oil or butter (which is what I previously used to indicate when the frypan is hot enough for food). The soft bakelite handle – securely attached to the pan body with rivets – stayed cool to the touch. One downside is the size. 26cm is the largest I would go (they have a 30cm pan as well). I would love to see a smaller one. Our stovetop is fairly small, so the 26cm is actually almost too big for our elements.